From the blogger A Polar Bear's Tale, the stained glass of S�ndor Nagy, Hungarian artist (1869-1950). 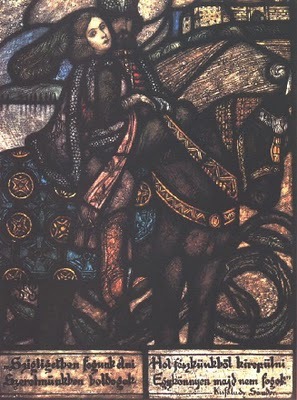 I managed to find a brief bio, plus small galleries on his stained glass, graphic work, andpaintings. Add his name to the group of eclectic artists all of whom were born between 1867 and 1869 and who had highly varied careers and who all made some kind of mark on the art of stained glass.